What Is the Lifespan of Walnut Trees? How Often Do Walnut Trees Get Nuts on Them? 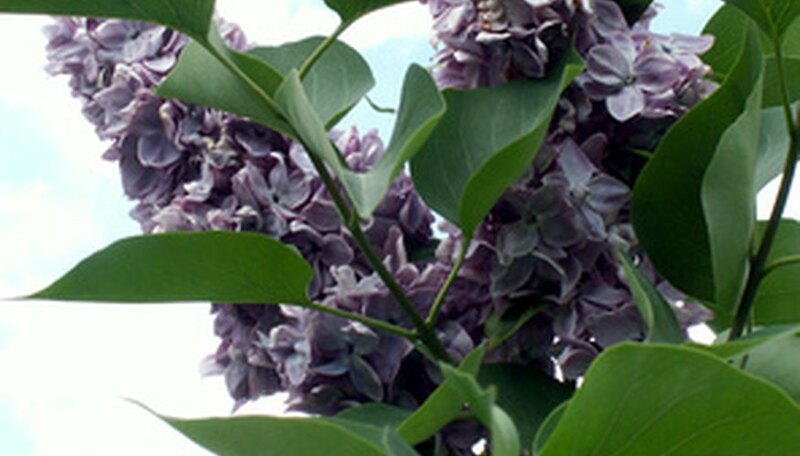 Can a Lilac Grow Near a Walnut Tree? 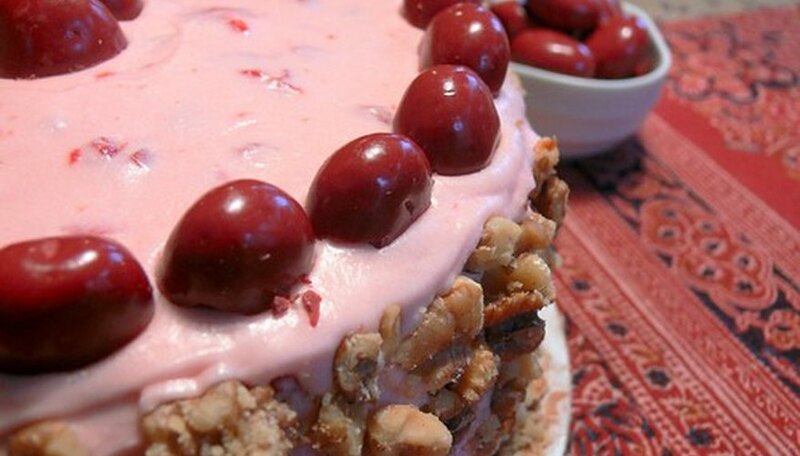 In addition to providing nuts, walnut trees are drought-resistant and provide shade. You only need to prune them occasionally to remove excess branches and keep the walnut tree healthy. When pruning a walnut tree, keep in mind that the trees can be grown with a central leader (which helps them grow large), or you can keep them smaller by removing the leader. The most common method is to keep the central leader. Avoid pruning from late winter to early spring, as the sap will seep out a lot during these times. The best time to prune is from half-way through the summer to early fall. Select the largest, most dominant trunk as a leader. The leader brings the nutrients up from the ground to ensure the other branches grow straight out. Use lopping shears (for large branches) and pruning shears for smaller branches to remove side branches. Cut along the lines where branches join each other or connect to the trunk. Along the leader trunk, remove the lower branches when the walnut tree is young. Keep larger branches close to the leader, as well as the smaller branches growing from them. Cut out the mediun-sized branches from all areas. Repeat this method to prune the walnut tree during the first few years of growth until the tree reaches 17 feet. Study the overall shape to the tree. English walnut trees’ canopies have a spreading, rounded shape. Look at the shape of the leaves to identify an English walnut tree. The leaves are oval and grow together in groups of five to nine alternating leaflets on a single stem. Identify the English walnut tree by its leaves’ size and margins. The leaves have smooth edges and are 5 to 9 inches long. Spot English walnut trees by studying the fruits. The walnuts grow in green husks, which split open and release the nut when they ripen. Inside the husk, the walnut’s shell is lumpy with a vertical seam along the length of the slightly ovular, light brown exterior. Leaf blotch creates brown spots on the nuts and leaves, causing them to fall from the tree. Root rot affects the roots, causing the tree to become stunted and the lower leaves to turn yellow and discolored. Leaf blotch is treated by removing and destroying infected leaves and nuts and applying a fungicide that contains hydrated lime and copper sulfate. Removing the trees is the only solution to root rot, as the roots are destroyed and the tree will never recover. Walnut blight produces black spots on the leaves with spots and holes in the nuts. Crown gall creates a gall or ball on the main stem of the tree. Walnut blight is treated by pruning and destroying affected areas and applying powdered copper sulfate. Treat crown gall by removing young trees and painting the gall on older trees with a commercially purchased gall treatment made from a natural strain of Agrobacterium radiobacter. This bacteria is a close relative to the crown gall bacteria and blocks it from entering the tree. Blackline is a disease that kills the tops of the trees and causes shoots to grow from the roots. The virus spreads quickly as it is carried by infected grafts, seed and pollen. Complete removal of the tree top is required to control blackline; there is no treatment. Start a new canopy by developing several suckers on the tree. The black walnut has the largest geographical distribution of any walnut in America, growing in most of the central eastern portion of the nation. Another type, the butternut tree, exists in the northeastern section of the country. In terms of size, the black walnut is the tallest species of walnut, with some growing to be 100 feet high. The butternut averages between 50 and 60 feet tall while western species such as the Arizona walnut and little walnut are smaller at about 20 feet. Walnut leaves fall off each year and are alternate on the twigs and compound. This means that there is a leaf at each individual node on the branch and the many separate leaflets on one stem comprise each individual leaf. The nut of the black walnut tree consists of a kernel encompassed by a hard round shell which itself has a tough husk surrounding it. This husk turns from green to yellow-black as the nut ripens. The Native Americans would boil kernels of the butternut tree to extract the butter-like oil for culinary purposes. The walnut tree has an average lifespan of 80 years. However, some walnut trees have a lifespan several times longer than the average human lifespan. Chop the leaves into small pieces by running over them with a mower equipped with a mulching blade or by raking them into piles and chopping them with a hoe. The leaves will compost more quickly if broken into small pieces. Layer the leaves in the compost pile with other organic matter, such as kitchen scraps or grass clippings. Leaves are naturally high in carbon, which composts slowly. Layering in high-nitrogen matter such as grass and vegetable peelings will speed composition and increase the temperature of the compost pile, which will break down the juglone more quickly. Water the compost pile to keep it moist but not soggy. Moisture encourages the growth of organisms that speed decomposition and hasten the transformation of the leaves to healthy compost. Turn the compost pile regularly to aerate the contents. This also hastens decomposition. English walnut trees grow between 40 and 60 feet tall with an equal spread. They have smooth, gray bark, a spreading, rounded crown and pinnately compound leaves, which means that 5 to 7 pairs of leaflets grow opposite one another on a leaf stem. The male trees produce catkins, or flower clusters that have no petals, while females produce short, spiky flowers that are replaced by edible nuts. English walnut trees grow in United States Department of Agriculture plant hardiness zones 3 through 7, which includes cities such as Tomahawk, Wis., Columbia, Mo., and Oklahoma City, Okla. They prefer well-drained, nutrient-rich soil and full sunlight. English walnut trees are susceptible to attack from caterpillars and webworms. They are also susceptible to anthracnose, leaf spot and root rot, among other diseases. English walnut roots produce toxic chemicals called juglones that damage or kill many plant species such as tomatoes, potatoes, peonies and azaleas, among others. The nuts, which mature in the fall, can be messy. The trees have a deep taproot that makes transplanting difficult. Plants For A Future recommends only pruning trees when they are dormant; they bleed profuse amounts of resin and become weak from pruning injuries. In the spring, small, green husks, containing walnuts emerge from small, inconspicuous flowers on the tips of walnut tree branches. Throughout the summer these husks continuously expand around the developing walnuts. Harvest season for nuts occurs during the months of September or October, as the nuts fall from the tree. At best, trees produce nut yields once a year during the fall. 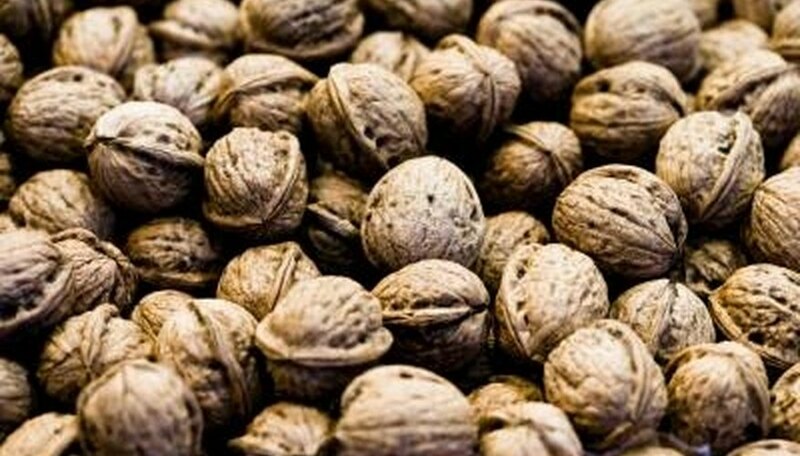 However, many walnut tree cultivars, particularly outside of commercial production, are prone to alternate bearing of nuts. This is characterized by one year of intense over-production followed by a year of little to no nuts. Total annual nut yield is only one of the considerations for cultivar selection. Other important considerations include quality of nut yield and ease of cracking. Black and Persian walnuts release the chemical juglone into the surrounding soil as a defense against insects and fungi. Lilacs planted near them--or several other walnut family trees--may develop walnut wilt or stunted growth in response to the juglone.